Home Sustainable Home & Office 5 Easy Ways to Green Your Holidays! Saving our earth and natural resources is everyone’s gift to the planet. Everyone can make a difference. So why not start this holiday season? Here are 5 easy ways to green your holidays! Mother Earth will be glad you did. 1. Buy local & Eat Local. From farm to table is the best way to think. Shopping for local produce is better for you because produce is fresh – literally from your local farms. Shopping local also saves on saves on green house gas emissions. 2. Shop using reusable shopping bags. Keep reusable bags in your car. You never know when the inspiration for shopping will hit! 3. Give the gift of green. 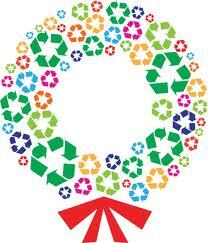 Visit your local thrift or antique shop and find a great gift to recycle. You might also get creative and make a gift out of materials you already have. Taking extra care to pick out a special gift or make a special gift, is also a unique and beautiful way to express your appreciation for someone special. 4. Save trees! Entertain using reusable utensils, dinnerware and linens vs. disposables. When it comes to clean up, cleaning reusable products may take a little more time, but at least all that trash won’t be dumped into our already overflowing landfills. 5. Recycle & Recycle. Bottles, boxes, cans, glass jars, anything that can be recycled, place them in your blue recycle bin.